We need your help to end testing madness! 1. Encourage friends, relatives, and co-workers across North Carolina to sign the Petition AND contact their legislators. 2. Ask your PTA, PTSA, or PTO to circulate the Petition. The National PTA has adopted a position against high stakes testing so, PTAs are allowed to take action. 3. Print this mini-flyer (6 to a page) and carry some with you. Pass them out at your place of worship, clubs, and gatherings. 4. 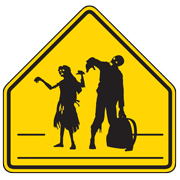 Copy the zombie picture and use it as your Facebook profile picture!